The (new) Nurburgring is in use this weekend for the German Grand Prix. Up in the mountains, it is close to Michael and Ralf Schumacher’s home town of Kerpen, so I am sure both of them have done many laps of the famous “old” Nurburgring. Unfortunately, the days of the old circuit through the forest have gone, as far as F1 is concerned. Following claims from the drivers that it was too dangerous, this new 2.882 mile circuit, with little character, was constructed in 1984, close to the original track. It is of interest to note that the first thing that the new generation of F1 drivers do on arrival at the circuit, is to shell out a few Deutschmarks to drive the famous old circuit, the Nordschleife! I will be watching from my perch at Jameson’s Irish Pub Soi AR, in front of the big screen. Join me before 6 p.m. for a meal before the action starts at 7 p.m. We watch the South African feed and do not have to worry as to whether UBC will show it, and we don’t have to suffer the adverts either! Last week I mentioned that engineer Malcolm Loughead invented a hydraulic brake so what did he call it? (Clue – think phonetics.) This was really simple, he called the company and the brakes “Lockheed”, which eventually went on to being the aircraft company. So to this week What did the original FIAT 500 have in common with the 1961 Lincoln Continental? Clue: don’t contemplate suicide over this. German luxury cars topped the list of most frequently stolen vehicles, with Audi and BMW number one pick for a heist, followed by Jaguar. I wonder if it ever occurred to the compilers of this earth-shattering research that there is no profit to be made in selling cheapies, but for the same amount of effort car-jacking the expensive vehicles gives a much better financial return. Thieves are not financially unaware. The same company also looked at crash experience, and found that expensive cars were crashed (or made claims) more than the cheapies again. And the safest at 30 percent less than the average? Daihatsu wins again! Looking at those statistics, when you buy an Alfa Romeo you’re going to get wrecked, one way or another, that is if the car thieves haven’t got it first. The big news is the release of the “new” (retro-style) FIAT 500, and it does certainly remind you of the old one. 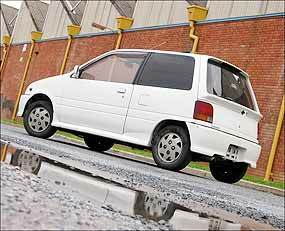 However, the old one was definitely a micro car and very inexpensive. That is what made it so popular. Anyone could afford one. That may not be quite the same for the new one. It seems as though FIAT want to get on the trendy Mini bandwagon, with scores of options in trim and equipment, with this new car, with 12 colors and 15 interior trims. In comparison, the old one was produced for nine years before it even got carpets and reclining seats! According to the news around Italy, FIAT has already taken 40,000 orders for their new baby. 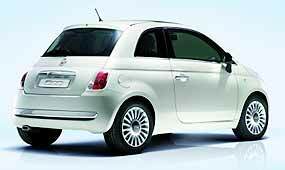 The new 500 was designed by the Centro Stile Fiat in Turin and will be built in the Polish factory of Tichy. The 500 is 3.57 meters long, 1.65 m wide, 1.49 m high, with a wheelbase of 2.30 m.
Initially (and in Italy), the engine range will be composed of one turbodiesel engine and two naturally aspirated gasoline engines: the 1.3 liter Multijet turbodiesel engine with 75 ps, the 1.2 8v engine with 69 ps and the 1.4 16v engine with 100 ps. All will be coupled with 5 or 6 speed manual gearboxes. Nothing is said about the eventual use of the other power-steps of the 1.3 Multijet engine (90 and 105 ps), or about what engine will be used in the upcoming 500 Abarth (perhaps it will be the 1.4 T-Jet, soon available in the 120 and 150 ps versions on the Bravo). This is where the old 500 and the new 500 are totally different. The previous model was indeed had a 500 cc (well, 499 anyway) engine, while this new one is almost triple the capacity. The new one has seven airbags and discs at the front. The old one had no airbags and tiny drums all round. The original sold over four million of the 500’s, but without the minimalist cheapness of the old model, I doubt if the new one will have such a run. It looks like being just a ‘trendy’ vehicle, and as such can suffer an early death when something even trendier comes out. I have written before about electric cars, and how I believe that they are the vehicles for the future. Only electric vehicles have the ability not to pollute the planet or produce greenhouse gasses, and do not need an expensive public fuel delivery system to get the fuel to the vehicle. We already have power grids to our homes. Reticulation is free. Electric motors have been around for well over 100 years, and the technology in converting electricity into rotational movement is well known, and becoming increasingly more efficient. All that we need now are lightweight, rechargeable batteries to power the on-board electric motors, and we have the power source that does not pollute, and can be recharged in our own homes, using the electricity grid. Just like our mobile phones. If you accept that basic premise, then it would seem logical that we should be looking at new battery technologies, rather than trying to work out how to deliver the dangerous chemical hydrogen to the consumer. A powerful lightweight rechargeable battery is all that we need to enter the next automotive era. However, when will that be? These radical new Partanen patent Europositron-based batteries are capable of being manufactured with minimal changes in existing manufacturing processes. With a theoretical energy density of 2,100 Wh/litre, cycle time of more than 3,000, an operating temperature range of minus 40 to 70 degrees centigrade, life expectancy of 10 to 30 years and the use of abundantly available aluminium, this technology promises to transform the global battery market. I am not the only person that feels this way. Researchers at the Massachusetts Institute of Technology are developing a battery that could do just that, and also might never need to be replaced. The MIT team have seen that although devices powered by electricity have become more hi-tech, the batteries to make them portable are not so hi-tech. In fact the battery technology has been largely ignored, comparatively. Just as Partanen uses existing technology to manufacture his batteries, the MIT team have done the same. They turned to the capacitor, which was invented nearly 300 years ago. According to the MIT research team, capacitors contain energy as an electric field of charged particles created by two metal electrodes. Capacitors charge faster and last longer than normal batteries. The problem is that storage capacity is proportional to the surface area of the battery’s electrodes, so even today’s most powerful capacitors hold 25 times less energy than similarly sized standard chemical batteries. Up till now, this has been a problem that could not be overcome, but the researchers solved this by covering the electrodes with millions of tiny filaments called nanotubes. Each nanotube is 30,000 times thinner than a human hair. Similar to how a thick, fuzzy bath towel soaks up more water than a thin, flat bed sheet, the nanotube filaments basically increase the surface area of the electrodes and allow the capacitor to store more energy. This technology has broad practical possibilities, affecting any device that requires a battery. Schindall said, “Small devices such as hearing aids that could be more quickly recharged where the batteries wouldn’t wear out; up to larger devices such as automobiles where you could regeneratively re-use the energy of motion and therefore improve the energy efficiency and fuel economy.” Not quite perpetual motion, but heading in that direction. Schindall and his team are not alone in looking at capacitors as the future of batteries, with a research group in England recently announcing advances of their own. However, Schindall’s MIT group expects their prototype to be finished in the next few months, and they hope to see them on the market in less than five years. Schindall thinks hybrid cars would be a particularly popular application for these batteries, especially because current hybrid batteries are expensive to replace. However, I believe that Schindall is actually selling himself short. An all-electric vehicle powered by his powerful batteries, rechargeable at home, rather than relying on re-using the energy of motion, would to me make more sense. Whatever, the future is here. It is electric. And we need be held to ransom by oil producing countries no longer. The future is getting brighter.